Some predict that within 15 years, 90% of articles will be written by AI. The author of this passage was, in fact, an artificial intelligence (AI) programme called WordSmith, which turns structured data into a compelling text indistinguishable from one written by a human author. The advances of AI in journalism are just one element of the rapidly-approaching breakthrough in the technology. AI is getting better at a range of tasks, including many areas thought to be the province of human beings, as illustrated by the infographic below. The AI industry is expected to expand by a compound annual growth rate (CAGR) of 50%f rom 2015-25, and is on course to be worth $127 billion by 2025. “AI is set to be the largest driver of tech spend over the next decade,” Sarbjit Nahal, Managing Director at Bank of America Merrill Lynch. In the process of this growth, many creative industries will be automated to some extent by AI, because their value chains work in similar ways. They each start with content creation or collection, move on to processing and editing, and end in distribution. And once AI grasps the mechanics of one creative process, it can quickly be applied to another. Journalism is one sector within the creative economy that has adopted AI into its creation process. It provides a paradigm as to how the technology may develop in other creative activities. 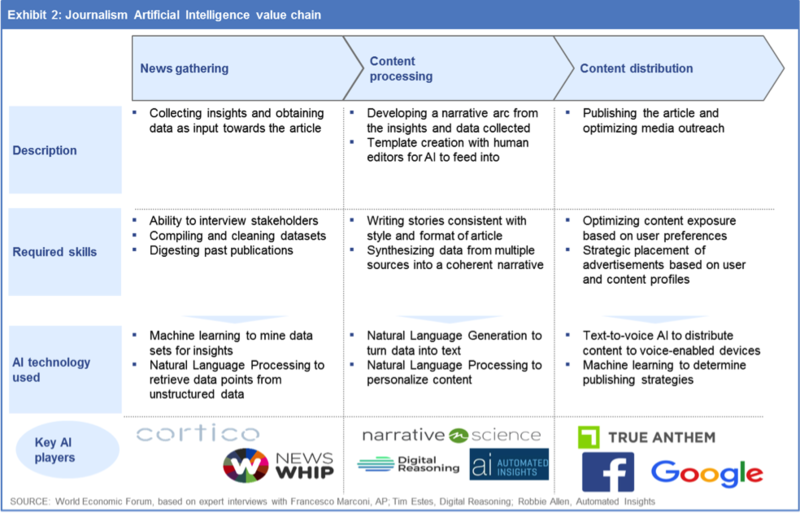 Across this value chain, there are three ways that AI is changing the practice of journalism. 1. Automating routine reporting: The use of AI in journalism has helped to rapidly expand coverage; the Associated Press was able to expand the number of companies it reported on from 300 to 4,000 using AI to generate reports on corporate earnings. A Stanford study found evidence that the additional companies reported on experienced increased trading activity and market liquidity, thereby strengthening the market. Elsewhere in the industry, the co-founder of NarrativeScience predicts up to 90% of articles will be written by AI within 15 years. Similar technology is available to summarise long articles into bite-sized content for social media. The technology can save journalists time, freeing them up to conduct interviews with real people. “Narratives are just another form of data visualization. Look at a young sports reporter; he would say he’s not scared. He can have high school baseball stories written by AI, so he can go out and do more interesting things,” says Jeff Jarvis, founder of BuzzMachine. 2. Providing faster insight: AI has the ability to instantaneously react to real-time data with the outlines of a story. Quarterly reports, such as performance and attribution reports released by large mutual funds, used to take weeks of effort by a small team of portfolio managers to draft. These reports can now be prepared by AI in a matter of seconds. Reuters, one of the largest news providers, has partnered with Graphiq, a service that uses AI to build and update data visualizations. The tool enables faster access to data, and, once they are embedded in a news story, the visualizations are updated in real time. 3. Lowering barriers to entry: Finally, AI can reduce the human element in the content creation process—in fact AI is being used today to allow journalists to create short videos from text in seconds or collect information from on-the-ground sources. However, this does not eliminate the need for reporters. Harnessed properly, AI will allow local and regional news companies to create compelling content in order to compete with large newsrooms. If the quality of a news piece depend less on the skills or experience of a single reporter, today’s biggest news companies could lose some audience share to a few dynamic upstarts that are able to use AI effectively. “The market is oversupplied with content, and the only way to compete is to deliver more and better at the same time. Publishers can get volume through automation, and quality through augmentation, which can help distinguish content from other providers,” according to Francesco Marconi, AP’s co-lead on AI. 1. Availability of data: Machine learning works best when there is sufficient data for it to pick up on patterns, learn from them and optimize the system accordingly. While human beings can analogize experiences and intuit optimal responses through just a few similar experiences, AI requires large amounts of data to know what the correct response ought to be. Without the availability of data, the ability of AI is limited. “For deep learning to work well, you may need millions of data points,” says Takuya Kitagawa, Chief Data Strategy Officer at Rakuten. 2. 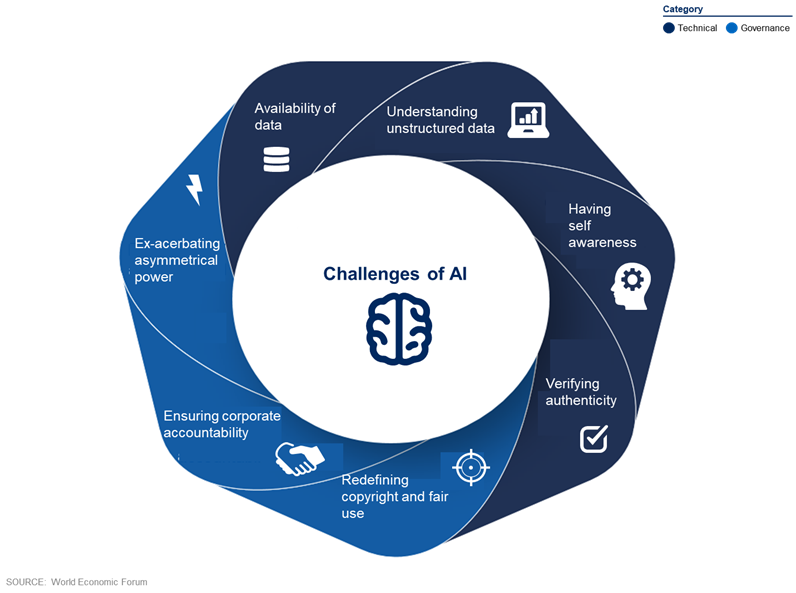 Understanding unstructured data: AI also has difficulty with unstructured data. 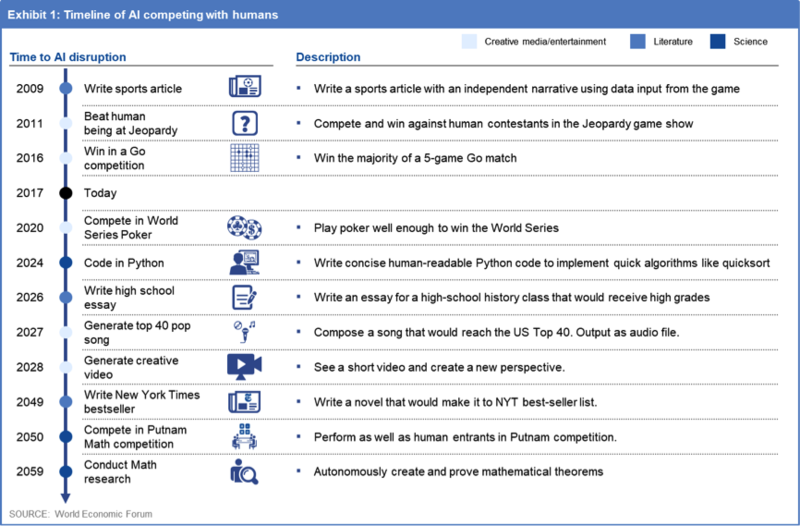 Tabulated results of sports games or earnings data can be easily translated into articles by using standardized templates, but if AI is to become more widespread in the creative economy, it will need to harness and synthesize unstructured data, which makes up most of the data available today. 3. Lack of self-awareness: AI is unable to explain its output: why it wrote what it did, or how it got there. In order to understand how data translates into a particular story, designing AI to be accountable to consumers will need to be thoughtfully considered. One way to achieve this – especially with data-heavy content where AI has a natural advantage – might be by allowing consumers to adjust the parameters of an algorithm to see how the results change. When applied to news, it is worth considering whether new journalistic standards need to be developed so that users know whether a story was authored by a machine or human. 4. Verifying authenticity: AI cannot distinguish whether the input it receives is accurate or inaccurate. This can lead to issues around authenticity – if AI receives questionable input, the corresponding output may be false. The solution is to develop and implement mechanisms to ensure the authenticity of articles that are shared online. This could include metadata and trackbacks for facts and sources. 5. Redefining copyright and fair use: New technologies have frequently challenged copyright laws in the creative industries. Machine learning potentially poses a new conflict, because it involves AI learning from human-created ‘expressive’ works – a data set of articles, paintings or music, for example, that tend to have rights owners – and generating its own output. This is likely to test the legal interpretation of ‘fair use’, where copyrighted material is used to produce new and ‘transformative’ content without permission or payment of royalties. 6. Ensuring corporate accountability: Since AI cannot be held legally accountable, human accountability needs to be embedded in all stages of the content value chain. Content distributers such as Facebook, Google and Twitter hold unparalleled power to inform and shape public opinion, because AI algorithms are used to determine the relative value of content that appears in front of users. The platforms as owners of the means of production therefore have a responsibility to prevent the dissemination and promotion of damaging information by the algorithms they have developed. While better measures are needed to ensure that intentionally misleading content is stopped at the root, one might ask whether false news and disinformation persist because the commercial incentives to increase engagement are too great to resist. 7. Exacerbating asymmetrical power: The biggest newsrooms are building their own AI, but smaller outlets may not have the financial ability or technical expertise, and would be forced to license proprietary content. The fear is that choosing to ‘buy’ rather than ‘build’ fuels an ‘arms race for AI’ that consolidates power amongst a handful of companies. A similar dynamic may emerge elsewhere in the creative economy as AI becomes more widespread – in the same way that advertising has become more reliant on tech giants for revenue growth, other creative industries may see their operating infrastructure designed by Silicon Valley. Despite the challenges, The World Economic Forum is optimistic about the development of this technology. However, a pessimist would be justified in asking whether we should completely trust the industry to regulate it. Organizations like OpenAI argue that the “industry is investing such vast sums of money into AI research that commercial, private entities were on track to create the first powerful AI systems, and these entities don’t have a built-in mechanism to ensure that everyone benefits from advances”. The System Initiative on the Future of Information and Entertainment will continue exploring the role of AI in other creative industries in our upcoming research, which will be published on our Mastering a New Reality project home page in coming months. For now, this article has been brought to you by a mere mortal. In addition to the experts quoted, the authors would like to thank the following constituents for their input and comments on this article: Robbie Allen, Automated Insights; Kazuto Ataka, Yahoo! Japan; Charlie Beckett, London School of Economics and Political Science; Liangliang Cao, Hello Vera; Vivian Chan, Sparrho; Trevor Darrell, University of California, Berkeley; Luba Elliot, British Interactive Media Association; Tim Estes, Digital Reasoning, James Fan, Hello Vera; Luciano Floridi, Oxford Internet Institute; Stuart Frankel, Narrative Science; Dhruv Ghulati, Factmata; Justin Hendrix, NYC Media Lab; Takuya Kitagawa, Rakuten; Tak Lo, Zeroth; Pablo Martinez Flores, Klustera; Sarbjit Nahal, Bank of America Merrill Lynch; Ed Newton-Rex, Jukedeck; Illah Nourbakhsh, Carnegie Mellon University; Vyacheslav Polonski, Oxford Internet Institute; Nick Rockwell, New York Times; Stuart Russell, University of California, Berkeley; Russell Stevens, Cortico.